At Parker Ranch — a cattle ranch founded in the early 1800s and the largest in Hawaii — a 400-kW Go Electric microgrid will ensure that cattle never go thirsty due to outages that have plagued the ranch for years. Situated near the end of Hawaii Electric Light’s (HELCO) distribution line on the Big Island are pumping stations that move water to fill troughs for the ranch’s cattle, said Lisa Laughner, CEO and founder of Go Electric. Her company in late October was awarded the contract for the microgrid. If there’s an extended outage, it’s possible the cows wouldn’t get enough water, she said. The microgrid helps protect the health of hundreds of thousands of cattle at the ranch, located in Waimea. The ranch owns about 26,000 head of cattle and pastures as many as 17,000 at the ranch at any given time. With 130,000 acres of grazing land, the operation requires a water system made up of 175 miles of pipeline, three reservoirs, 145 water tanks, three dams and 650 water troughs. Not only will the solar microgrid ensure that the herd gets water, it will also provide resiliency to a neighboring business park, and services to HELCO’s grid. The microgrid includes 250 kW of energy storage and diesel backup, and will draw solar PV from a 225-kW array being built by Rising Sun Solar. The ranch signed a 20-year power purchase agreement (PPA) for the solar power and a lease agreement with Go Electric, Laughner said. Go Electric received a grant from Elemental Excelerator, which provides up to $1 million for projects. Half of the undisclosed amount will help pay for the ranch project; the other half will go toward a yet-to-be announced project on Maui, she said. Elemental Excelerator provides grants for startups in energy and other sectors. The biggest savings for the ranch will come from the solar PV because it will replace expensive HELCO power, said Laughner. Go Electric will earn income from the project though the lease payments from Parker Ranch and income from HELCO for participating in demand-response programs. The company’s other Hawaii projects will also participate in other demand response programs, she said. 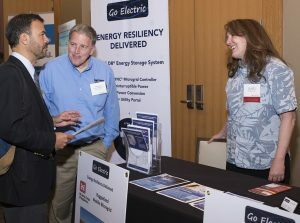 The company provided microgrid control technology for the Camp Smith US military base in Oahu and also participates in HECO’s demand-response pilot. 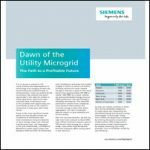 An important feature of the Go Electric microgrid is its controller, which uses the battery as the main hub for microgrids, explained Laughner. If the grid gets stressed by demand, the controller can island the microgrid from the grid, she said. And when the microgrid does island from the grid, the transition is “blipless,” she said. The transition happens quickly, with no energy resources turned off or computers re-booted. “This makes it a nice smooth transition for businesses in the business park,” Laughner said. A year ago, Go Electric was awarded a contract by the U.S. Army Corps of Engineers Construction Energy Research Lab for a new mobile military microgrid project. The device aims to provide supply-side energy management by integrating a number of energy sources, among them engine-driven generators, and renewable energy assets with battery energy sources. That was the company’s fourth military project. Others include a battery energy storage system that’s part of a microgrid at Tooele Army Depot; the Spiders Phase III microgrid, at Camp Smith, Oahu, Hawaii, and a battery energy storage system supporting the installation of a microgrid at Fort Custer, according to company materials. Go Electric will also provide four small businesses in New York City with demand response systems that aim to ensure they are resilient. The company was a winner in the $30 million innovative technologies competition for the RISE: NYC program (Resiliency innovations for a Stronger Economy). It is possible to deliver the resiliency and reliability to this project without batteries with our solar pumping systems. We would like to discuss this cost saving potential with the project sponsors. Pls contact me at exxterra@gmail.com.